We would like to give a big thanks to everyone who attended our Magic the Gathering – Charlottesville City Championship Tournament this past Saturday. It was a great turnout and we love having everyone at the shop. Although returning three time Champion JM put up quite the fight, after all was said and done Ken Hankins was able to pull off the Regicide. 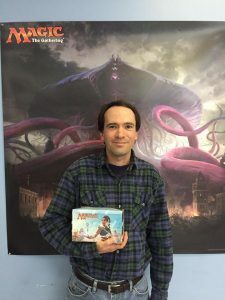 Ken will be getting his name put onto the Winners Plaque hanging in the store as well as receiving a box of each new release Magic set for a year! Ladies and Gentlemen, I present your Champion. Interested in how he got it done? Take a peek at what he as well as his competition were running with our Top 8 players decklists. There you have it! Only two decks were basically the same, even then they had their differences. A healthy mixture of Aggro, Control and Mid-Range is making Standard as exciting as ever! This entry was posted in Decklists, Event, Magic The Gathering and tagged Champion, Charlottesville, Magic The Gathering, Virginia. Bookmark the permalink.